The Old Testament book of Ecclesiastes contains a message vital to the Feast of Tabernacles and your salvation. Wealthy. Wise. Well thought of. These positive words describe ancient Israel's King Solomon. Yet Solomon wasn't satisfied with life; he was filled with depression and despair. Why? And what does it have to do with the Feast of Tabernacles? And how does it apply to your life? Let's understand. God gave the Feast of Tabernacles to Israel as a seven-day festival to be held every autumn, celebrating the fall agricultural harvest in the Northern Hemisphere. Temporary dwellings (a tabernacle is a temporary dwelling) were constructed to remind the Israelites of their journeys in the wilderness before they entered the promised land (Leviticus 23:1-2, 34, 39-43). Contrary to what many believe today, this Festival is still to be kept! Jesus showed that the law that includes the annual festivals remains in effect for us (Matthew 5:17-18). Both He and the early New Testament Church kept the festivals (John 5:1, 7:2, Acts 2:1, 18:21). 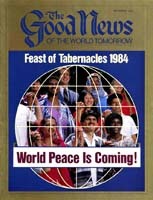 In the Millennium, all nations will keep the Feast of Tabernacles (Zechariah 14:16). For more information on God's true festivals and what each pictures, read our free booklet Pagan Holidays - or God's Holy Days - Which? The symbolic meaning of the Feast of Tabernacles goes far beyond what most people realize. Celebrating the physical harvest as it occurred in the area of Israel pictured the Millennium — the 1,000-year reign of Jesus Christ on earth (Revelation 20:6) — when we will "harvest" the billions of humanity who will enter God's Family! The Millennium will be a time of global prosperity, peace and obedience to God's laws. Staying in temporary dwellings portrays our own pilgrimage in the present evil world, and the fact that all during the Millennium will understand that they are pilgrims in their physical lives (Isaiah 11:9, 25:6-9, I Peter 2:11). With this in mind, let's consider the life of Solomon. He inherited the throne of Israel from his father, David. Sometime after his coronation, Solomon went to offer sacrifices at Gibeon, where God appeared to him in a dream and asked him what he desired. Solomon's answer: "An understanding heart to judge Your people" (I Kings 3:9). This reply pleased God, who fulfilled his request and also gave him riches and honor (verses 10-13). Through the years, Solomon acquired and enjoyed wisdom. land, ships, fine buildings, gardens, mines, skilled craftsmen, animals, money, a strong government, fame and secure borders. Solomon seemingly had it al1- riches, wisdom, power and fame. But something was missing — something that caused Solomon to hate life. This brings us to Ecclesiastes, the book Solomon wrote. The theme of Ecclesiastes is vanity, Solomon wrote: Vanity of vanities,' says the Preacher; 'Vanity of vanities, all is vanity'" (Ecclesiastes 1:2). The word vanity means "worthless, empty, fruitless, transient." What caused Solomon to look at life this way? Despite his accomplishments, Solomon could see that life is filled with sorrow (Ecclesiastes 2:22-23). And, ironically, as he learned more about the world around him, he grew even more sorrowful (Ecclesiastes 1:18). He saw rampant injustice (Ecclesiastes 4:1) — problems that defy solution (Ecclesiastes 1:15) — desires that remain unfulfilled (Ecclesiastes 1:8) — terrible tragedies (Ecclesiastes 6:2) — bitter envy and strife all around. (Ecclesiastes 4:4). Beyond these debacles, Solomon saw death, which so deeply disturbed him that he came to hate life: "Therefore I hated life because the work that was done under the sun was grievous to me, for all is vanity and grasping for the wind" (Ecclesiastes 2:17). Sad, isn't it? Here was a man who possessed and enjoyed all the things that so many people are striving for, and yet he said it was all worthless. Before you conclude that Solomon was completely wrong, consider this: "If in this life only we have hope in Christ, we are of all men the most pitiable" (I Corinthians 15:19). These words, written by the apostle Paul, are so true! Hope that ends in the grave is insufficient. It leaves you wanting more, craving more. This is the position Solomon found himself in — facing death and desiring more, wondering that there wasn't something else, asking, "Is this all there is?" But there wasn't any more. Solomon's understanding and wisdom were limited to this present life. Unlike David, his father, his eyes were apparently blinded at the time to the resurrection. Why? Solomon became a victim of sin, which limits spiritual understanding (I Kings 11:4, Ephesians 4:17-19). As Christians, we have hope — awesome hope: "Behold, I tell you a mystery: We shall not all sleep, but we shall all be changed — in a moment, in the twinkling of an eye, at the last trumpet. For the trumpet will sound, and the dead will be raised incorruptible, and we shall be changed" (I Corinthians 15:51-52). Solomon finally realized, in old age, the value of building a right relationship with God, even though he failed to do so during the rest of his life. At the end of Ecclesiastes he wrote: "Let us hear the conclusion of the whole matter: Fear God and keep His commandments, for this is the whole duty of man. For God will bring every work into judgment, including every secret thing, whether it is good or whether it is evil" (Ecclesiastes 12:13-14). How deeply Solomon came to understand God's judgment is uncertain. From some of his comments, it could appear that he only saw God's purpose in light of physical blessings and cursings. As Christians, we understand that God's judgment involves our fate for all eternity (Matthew 25:31-46). What does all this have to do with the Feast of Tabernacles? And what does it have to do with you? Plenty. The Feast pictures the time when God will establish His Kingdom, when the members of His immortal, ruling Family will rule over humans who will also have the opportunity to become literal, born children of God. Those preparing for birth into God's Family must see the vanity, the futility, of living in the flesh, striving only for material success. Each must become in the flesh a pilgrim, a temporary sojourner whose ultimate purpose is to be born into God's Family. This does not mean that all physical pleasures and pursuits are wrong — not at all. But we must see them for what they are and rightly use them. Those entering God's Kingdom must build the right relationship with God. Such a relationship requires fearing God — standing in awe of Him, responding to His authority. As Psalm 111:10 says, "The fear of the Lord is the beginning of wisdom; a good understanding have all those who do His commandments." So you can see several parallels between the messages of the Feast of Tabernacles and the book of Ecclesiastes — coming out of vanity, rejoicing and fearing God. All are essential for your salvation. Reject the vanity, the shallowness, the emptiness, the temporary and transient values of this world. Completely come out of the world and its evil way of life (Revelation 18:4). Forsake materialism (Matthew 6:31-34). Don't strive for personal glory — temporary acclaim and adulation from other people (Philippians 2:3, Galatians 5:26). Put your eyes on God's Kingdom (Colossians 3:1-2). During the Feast you'll hear inspiring messages that will help you do this. You will also be separating yourself from the world by fellowshipping with spiritually minded brethren. Learn to rejoice and enjoy fine meals and exciting activities with your family and friends, using your second tithe. Rejoice in living God's way of life and knowing His wonderful plan of salvation: "Be glad in the Lord and rejoice, you righteous; and shout for joy, all you upright in heart! … And my soul shall be joyful in the Lord; it shall rejoice in His salvation" (Psalm 32:11, 35:9). The rewards for deeply respecting and revering God are many. You will avoid the wrong way of life (Proverbs 16:6). Your wisdom will increase (Proverbs 15:33). Your blessings will abound (Psalm 145:19). Your destructive fears will be replaced by godly confidence (Psalm 118:6, Proverbs 14:26). Most importantly, God will give you eternal life as a glorified member of His own Family (Psalm 16:11)! Lord shall inherit the earth" (Psalm 37:7, 9). Think about that — someday you can inherit the earth. Someday you can enjoy life as God enjoys life. As you await that glorious day, now soon to come, learn the vital lessons taught by the Feast of Tabernacles and the book of Ecclesiastes. By doing so, you will be learning how to become a member of God's Family!